The story of China's devastating drought of 1942 is a remarkable one. With the potential to tell an insightful political tale through the lens of personal suffering, it's a shame that veteran director Xiaogang Feng (Aftershock) pollutes the story with shoddy filmmaking and muddled shifts in perspective. A random radio voice sets the stage during the opening credits; in case the significance of the titular year is lost on anyone, China was then at war with Japan and the Axis powers of WWII. We flip to a seemingly random narrator recounting news items from around the globe in '42, then finally to the beginning of the story proper. Focusing on one village in the province of Henan, Feng wastes little time in depicting the zeitgeist of desperation that's the catalyst for increasingly brutal acts of depravity throughout the film. Starving, a woman caught in the act of stealing is about to be forcibly prostituted for grain when bandits seeking food approach the village. Weakened by hunger, both sides elect to negotiate rather than fight. Paranoia has other plans though, and the distrust leads to a violent battle that levels the town, leaving its surviving residents homeless. Unable to rely on government relief due to the war effort, the villagers set out on a trek across the country, seeking sustenance and shelter. 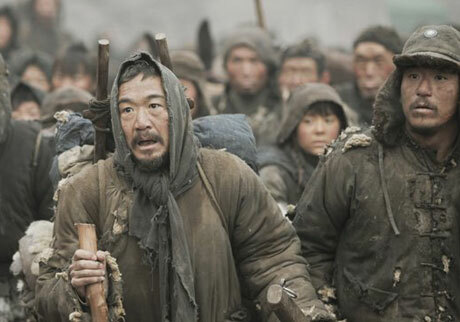 The acting among the principle refugees is quite strong, particularly Guoli Zhang's performance as village landlord Fan. Were the film more firmly tethered to the perspective of his and his extended family of survivors, Back to 1942 would be a cohesive and heartbreaking narrative about the great equalizing power of poverty. But, for a story about mass starvation, the movie is extremely bloated. As it is, the film spends a great deal of time jumping between underdeveloped political players. Seeing the machinations of power at work does give the picture a more rounded perspective, but it also becomes a bit redundant. We can see the effects these decisions have on the refugees, so there's no real need to see them being made. The vantage point roulette is further exacerbated by the presence of subplots involving an American reporter (Adrien Brody) trying to ferret out the truth regarding the severity of the situation in Henan, and an Italian priest (Tim Robbins, sounding more like a mafia don than a buddy of the Pope). At least Brody's reporter has a measurable bearing on the story's ultimate outcome; the only reason Robbins's character is present is to tie into yet another underdeveloped side-story about a Chinese convert who loses his faith after the bible proves to be an insufficient bandage for a giant, gushing shrapnel wound in a young girl's abdomen. That still doesn't cover all the switches in perspective that detract from the sympathetic human situation of 30 million citizens intentionally abandoned by a government helpless in the face of callous military manipulation. As frustrating as the fractured narrative can be, it'd be easier to overlook were it not for truly horrible performances by the two prominent American cast members, and even more so, the extraordinarily poor special effects and editing during numerous unnecessary scenes of the refugee flock being graphically bombed, not to mention mismatched film stock and colour grading throughout the feature.